If you lost your birth certificate or would like to have to abstract two copies of your vital record. The State of Arizona maintains all original certificates in the state archives and “issues” certified copies of these original certificates. These certified copies are official certificates printed on special paper that contains a raised and embossed seal and the official registrar’s signature, which are typically acceptable for passport, social security, employment, personal identification and other legal purposes. Who can request a Birth Certificate? In three ways you can get your Arizona Birth Certificate either apply in Person or apply by Mail or order online and receive them by express mail. Order your certified copy of Arizona Birth Certificate Online and receive them by express mail. Find the sample Arizona Birth Certificate. An Authorization Form with specific entitlement and identification requirements will be provided upon completion of your online order. This is the easiest, fastest and simplest way to get your Arizona Birth Certificate from the comfort of your home. 1. Fill the fields with necessary details. 2. Don't worry, if there is a typo or filled wrong information by mistake, you can edit the information before submitting. 3. Select the delivery options for shipping your Arizona Birth Certificate to your door steps. 4. You can track your order. 5. That's it, its all done online. 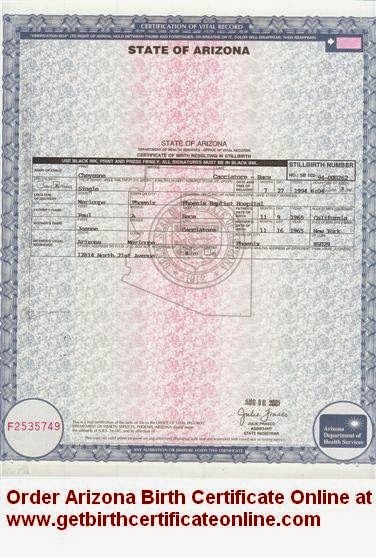 The 1st certified copy of an Arizona Birth Certificate costs $20.00. All additional copies are $20.00 each. Any documentation received from a hospital and/or a midwife are not official certified copies of the Arizona birth certificate. 1. Download and print an application form. 2. Fill up the application form with necessary details and sign your application. 3. Applicant must bring a valid government-issued photo identification with has your signature. 5. Pay the appropriate fee either by cash, traveler's checks, cashier's checks, money orders, or by major credit/debit Cards. $20 per copy: Short Birth Certificate is available for the birth occurred within the State of Arizona from 1990 to present. $20 per copy: Long Birth Certificate is available for the birth occurred within the State of Arizona from 1903 to 1989. Note: the state office does not accept personal checks (pc). 3. Provide a copy of the front and back valid government-issued photo identification with has your signature OR a valid notary signature and seal on the application form. 4. Include all proof of eligibility (like relationship with registrant), if you are not the registrant or the parent named on the certificate. 5. Mail the signed application form, all the necessary documents and details of appropriate fee and the payment methods with a self-addressed stamped envelope to your local Office of Vital Registration. Note: The average processing time for applications submitted through the mail is 15 to 20 business days from the date the application is received by Vital Records. Arizona county Offices of Vital Registration: Payment types accepted at office locations: Cash (C), Money Order (MO), Personal Checks (PC), Credit Cards (CC), Debit Cards (DC), in person only. 75 W. Cleveland 4115 E. Foothills Dr.
1090 Commerce 1818 W. Adams St.
1415 W. Melody Ln., Bldg. A 2625 N. King St.
County Administration Building 36235 N. Gantzel Rd.